The global technology market is ever-evolving, and companies have not shied away from implementing them in workplaces. Amazon too has been working to create and patent a wristband system, to keep an eye on their workers in the huge warehouses and optimize the work. In this article, a controversial patented system that is expected to change the logistics of workplaces has been described - wireless wristbands for workers. This system is comprised of bracelets that are meant to monitor workers' movements and help them make the right decisions, independent of location and time. Some estimates have indicated that this will ensure an extraordinarily high rate of productivity, while others believe that it could be a dangerous threat to human rights. As mentioned earlier, organizations are always looking for innovative means to increase the quantity and quality of workers' output. Amazon has been no exception, and these wristbands stand witness! 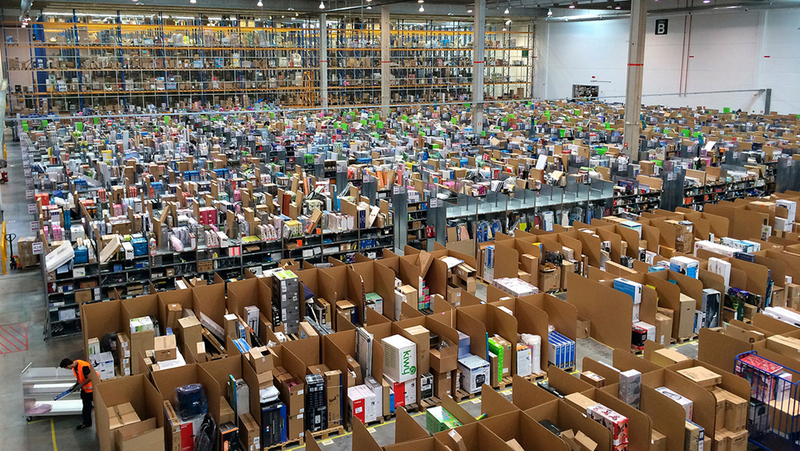 According to the patent, the warehouse employees of Amazon will be equipped with ultrasonic wristbands. The corresponding device is a handheld scanner that continuously sends signals, which, in turn, determine the workers' location. The system tracks specific positions, from given inventory bins, at any time. At the same time, it also stores, processes and transmits data in real time, which is very useful for overall performance. With signal processing, these devices can analyze coordinates of objects inside the warehouse space. The setup can detect the relative position of the workers' hands and the inventory item that is to be processed. After this, it matches the hands for the project along with the products. One wrong move and the bracelet will immediately buzz! The entire equipment includes ultrasonic devices placed around the warehouse, a management module with artificial intelligence for overseeing, and the wristbands themselves. In effect, the system’s sensors triangulate to the wristband's signal in order to pinpoint the location of workers. This is meant to increase efficiency and overall productivity. In the second stage, the system sends guiding signals back, in the form of feedback messages. This ensures that the working staff are aware and informed of their hands' positions with respect to the inventory bins. While it is debatable, some studies predict an exponential improvement in production and employee efficiency. Although in the past, there were many failures and a reduced interest in this model, the technology has sufficiently matured and is robust enough for the system to exhibit high efficacy. Also, with the testing of this prototype, subtle differences in each workday was observed. Workers could perform better and faster because they were ensured of correctness and excellent performance. The patent for the ultrasonic wristband was filed by Jonathan Cohn, a senior technical program manager at Amazon Go. The radio-frequency wristband system was proposed by Tye Brady, chief technologist at Amazon Robotics. The inventors believe, "The system circumvents the need for computationally intensive and expensive monitoring by means of computer vision, a la Amazon Go." Could This be a Violation of Human Rights? Electronic commerce giant, Amazon, has been accused of many things. But this innovation was only developed to be a time-saving method, and not to negatively affect workers' integrity. People around the world reacted poorly to the idea, and many articles were published in defense of the working class. Now, it is true that these unique wristbands will be able to track every movement. They could seem invasive too, in turn, putting undue physical and psychological pressure on workers. But, these are only assumptions. If applied in a manner that respects personal freedom, the results prove useful. As per the creators, these wearables are guaranteed to make the workers more productive. The equipment will free up the employees' hands from scanners and their eyes from computer screens. As for checking inventory or fulfilling orders, it has all been automated years ago. With these bands, every worker will have the advantage of tracking his progress in order to complete the given work within a stipulated time period. They can also perceive if their hands are holding the right equipment and understand the correct sequence of movements to achieve desired outcomes. This tech-advancement is still in the experimental stages, at the moment. It is uncertain if it will translate into implementation as it is only a patent yet. In the event that the patent shows positive financial results, it could first be used in the Seattle-based fulfilment centers.